I know washi tape EVERYTHING has been done already... but I have to admit... this is the first time I've ever used washi tape on anything! I know. It's kinda crazy. Adam and I attended a wedding over the weekend and I wanted to include something handmade with the gift we bought for the newlyweds. I remember going through a ton of "thank you" cards after our wedding so I made the bride a few "thank you" cards to add to her stash. These are fabulous! 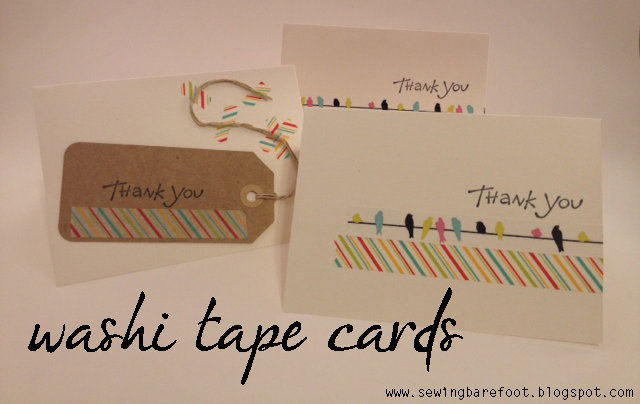 A great way to use up the small pieces at the end of the roll! I need to make some soon! They are super cute! That bird tape is so cool... I haven't seen one like it before! SUPER cute!! I love the birds on a wire! I want!! So cool! What a great idea. adorable! the birds on the wire are so cute!!! So cute I have a wedding in September they would be a great gift.